YO. I guess this is the year I admit I am turning into my mother. Definitely not a bad thing, it's just a surprise, that's all. Mom and I are very close, but we have many differences as well. (Not as many as I thought, though!) As a kid, my family would always bet on the fact that my mom was going cry at one point during a family gathering — out of happiness or when she was overcome with emotion. And lately, the holidays have made me super emo. Case and point? I opted to say the Thanksgiving blessing in an effort to keep Mom from crying this year; I didn't get through one sentence before I broke down and cried myself. Great job, Kirbie! But this post isn't about my hormonal outbursts. (I'm not pregnant, don't worry — I know many would be concerned if I were to bear a child at this point in my life. I digress.) Since I've always wanted to be like Oprah, I'm bringing back my holiday gift guide. If you want some major LOLs, go watch my old school holiday gift guides, which I filmed in my room with possibly the worst lighting of all time. Sure, it's late. But who actually plans ahead?! And I'm starting to think I'm turning into Gwyneth Paltrow (a $42 water bottle?!) but they're actually good gifts, so spare me. Here are a few of my favorite things! My philosophy on personalized jewelry is akin to that one woman on Intervention, who constantly sucked on crack lollipops and had half of her teeth rot out of her head: what’s one more going to hurt? 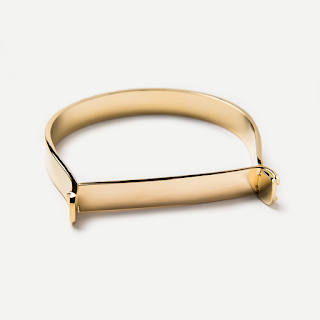 Miansai’s Thin Hudson Cuff is gold-plated and is the sexiest piece of hardware I've ever seen. (I own three different styles and everyone always asks who makes them!) This cuff has a large enough plate so that you can get it monogramed with whatever you want: a significant date, a mantra, or in my case, MY NAME, BIOTCH! To be honest, I was never a beauty personalization fan — I always think of Carrie Bradshaw’s version with the hideous font — even though finding my name on something is literally rarer than bumping into Jay Leno at Whole Foods on 3rd street, but the tide has turned. Maybe that makes me a narcissist? But who cares. Basically, I’m doing men at the bar a favor by wearing my name on my actual sleeve. Nothing says first-world privilege than a $100 giant candle from a store that sells $50 door knobs and $350 pillows. Once you get over the fact that this candle is, in fact, as big as a tire, you'll fall in love. This is the best-smelling (and most accessible) candle out there. Trust me. I usually buy a ton of tiny versions to give away for the holidays, and I love the room freshener as well. It's like you're actually living in an Anthropologie, which might drive me insane from time to time, but it still sounds lovely. See the Miansai bracelet, but change to "necklace." 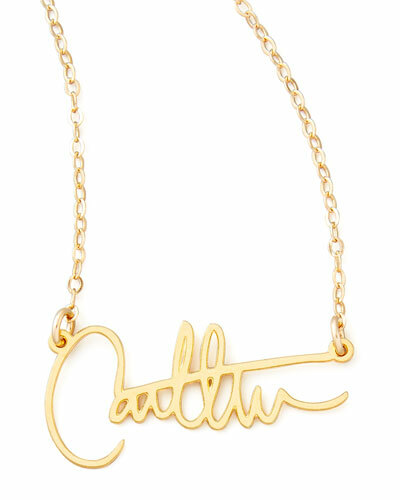 This is pretty cool because it takes something as personal as your own signature and makes it into jewelry. Once you place your order, you'll send in your signature to the Brevity team. What you get back is a 24K gold-dipped signature with stainless steel chain. Admittedly, this has to be a hard gift to give without ruining the surprise — "HEY, SIGN THIS, I NEED YOUR AUTOGRAPH!!!" — because unless you're going through someone's wallet or trash, when in the world are you going to have their signature? So it might be smarter to get them a gift card for this one, unless you love sleuthing through your loved one's personal property. Another option is to get this for a superfan since many celebrity signatures are online (like Harry Styles.... what? ), but I can't imagine spending $300 on something like that, unless you're in the cast of Rich Kids of Beverly Hills. Apparently Apple realizes the iPhone’s battery is temperamental, so they’re coming out with a case that Mashable compares to a "Dr. Scholl’s for your foot," that charges your battery all the live-long day. Sorry if this sounds snobby, but I don’t want some whack “cushion for my phone” displayed to the general public. I have a presh Sonix case with cacti on it, and I plan to keep it. (Unless they have the option to personalize a case.) The cooler way to charge your phone on-the-go is with Rebecca Minkoff’s Charging Wristlet. Wrap your phone up like it’s getting ready to hit a Rolling Stones concert in genuine leather, and protect it from shattering to smithereens while it rests gently inside, taking a nap and recharging. I had a great pair of over-the-ear Bose headphones when I was in 5th grade. They were a gift along with a portable DVD player, on which I'd watch Cast Away (with subsequent nightmares) and Holiday in the Sun. They were grand. But I haven't had a pair since. When working out, I like my wireless Beats or my new in-ear Bose headphones, but ever since I landed a job in digital TV production, I've realized nothing compares to the surround-sound of a good OTE headphone sitch. Sorry to my producer, Nicole, for stealing hers any time I can. 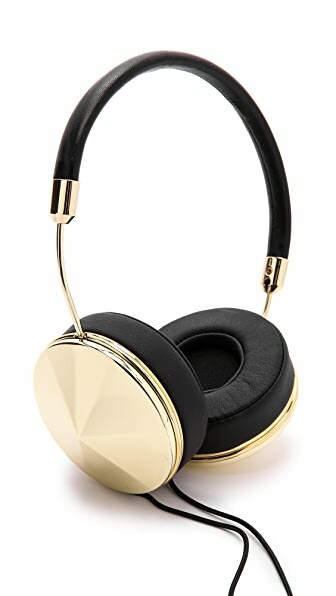 These are pretty AND I like the sound quality, too! Embarrassing moment: I actually owned this ring and now it's nowhere to be found. I also threw out the case, which was, as I recently learned, THE CHARGER. For the love. 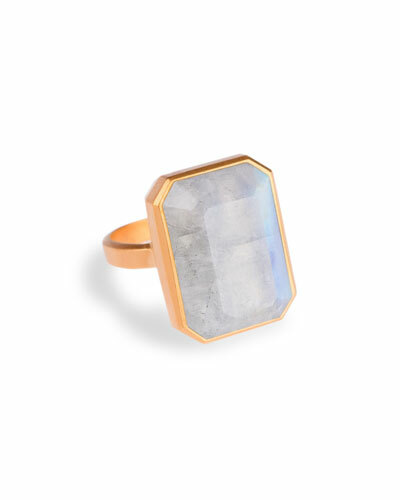 Ringly's Smart Ring is functional, polite jewelry. You can program it so it lights up, based on the alerts you want to get: your Uber is arriving, Mr. Wonderful just called, etc. In a society where everyone's nose is shoved in their phones, this at least gives people the option to have some manners. It comes in a variety of shades and finishes, but I think the gold with the moonstone is a classic. I have an obsession with sunglasses. Blame my mother, Janet – the woman should consider investing stock in solar protection eyewear. And one of my dreams is that, someday, I’ll have a luxurious closet where I can artfully (and neatly) display my bags, shoes and jewelry. If I’m investing my hard earned money in something, I want to display it every chance I can. This sunglass display from OYOBox will be put to great use – especially if it’s filled with a bunch of gorgeous sunnies from Illesteva, Tom Ford and Ray-Ban. 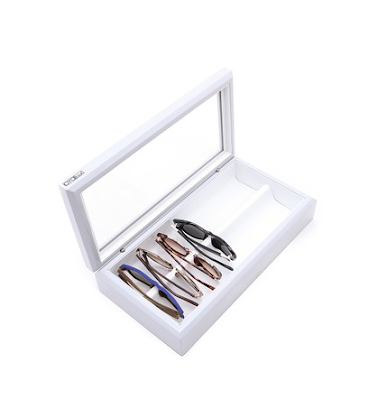 The box includes a see-through lid and velvet lining to nest up to eight pairs. This needs no description. It is the best. I figure I'll drink the recommended amount of water each day if it ends up in this chic gold water bottle. Swell bottles are built to last, and since it looks this good, there's a 100% chance I won't lose it, either. Bonus: you're saving the environment! According to know-it-all Susan Miller, because I am a Capricorn, I like refined, luxe or vintage gifts — the latter of which is where this gift comes in. I know this isn't an old-school record player. You go antiquing to find those! But I love that this record player from Crosley incorporates a classic turntable along with modern technology of a USB input. I would collect records if I had a turntable! Just to clarify, it does play records. It's legit. But it also includes the ability to play mp3s, too. It also includes built-in speakers. Why have a turntable without this?